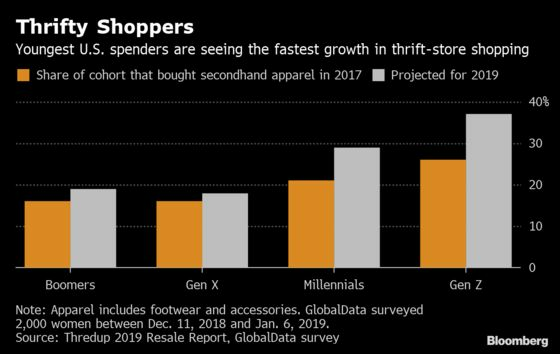 (Bloomberg) -- Goodwill is setting its sights on a formidable rival for a charity thrift store: Amazon. The nonprofit’s New York-area organization has teamed up with Price.com to develop a browser add-on that alerts online shoppers at sites like Amazon.com Inc. and Walmart Inc.’s Jet.com when a product they’re looking to buy -- say a mountain bike or a pair of shoes -- is available on Goodwill’s website. Shoppers can then click a pop-up link to order the second-hand version shipped to them instead. Eventually, the nonprofit wants to roll out the tool to include more inventory from other parts of the U.S. Still, Goodwill NYNJ said it doesn’t see the online push cannibalizing its physical stores, where it trains and employs thousands of workers every year, including seniors, veterans and people with disabilities who might otherwise have a hard time finding a job.